Healthy Thanksgiving – arts, ink. Thanksgiving is seen as a time for family and friends to come together and be thankful for the things they have in their lives. It has also become synonymous with lots of good food. The traditional Thanksgiving meal includes a giant turkey, stuffing, bread, cranberry sauce, pumpkin pie, and cherry pie. My family is one of these traditional families who always eat the same food every year with no exceptions. 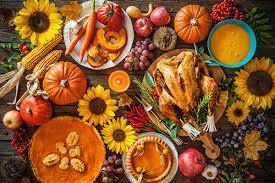 But with people now being more conscious of their diet and how food impacts the environment some Thanksgiving dinners are transforming from the norm. The biggest Thanksgiving food trope is having a gigantic turkey. My family even eats a turkey from my aunts farm that they have raised for the event. Now there are healthier options that people are choosing to eat as their main dish. Stuffed butternut squash is a great alternative because it is filling and squash still has the same nice fall feeling that turkey has. You can stuff the squash with other vegetables and rice that way if people do not like squash then they can eat the things that are stuffed in it. My family always has snacks out before the big meal so that people can munch on them while they wait and watch football. We usually have different types of cookies and chips and dip. Having snacks out before the meal is a great idea to keep people from getting antsy while the food is cooking, but chips and cookies are not the healthiest way to do it. A healthier option is to just put out a fruit and veggie tray. Everyone likes at least one type of fruit and/or vegetable. It will keep them occupied but it won’t fill them up before dinner. Mashed potatoes are another staple Thanksgiving food. Every family has their own mashed potato recipes and some are healthier than others. A good alternative to mashed potatoes is cauliflower mashed potatoes. This is a good alternative to mashed potatoes every day, not just Thanksgiving. A way to spruce up the cauliflower mashed potatoes for Thanksgiving is to make sweet potato and cauliflower mashed potatoes. You are still using potatoes, but you are not using as much because the cauliflower is most of the side dish. The last food that is popular at Thanksgiving is the dessert. A good alternative to apple of cherry pie is cranberry and blueberry crisp. You use fresh cranberries and blueberries so you are eating healthy fruit, and you are just putting granola on top instead of the less healthy pie crust.